Kardamili: olives, maps, flat earth?! Where will it end?!?! 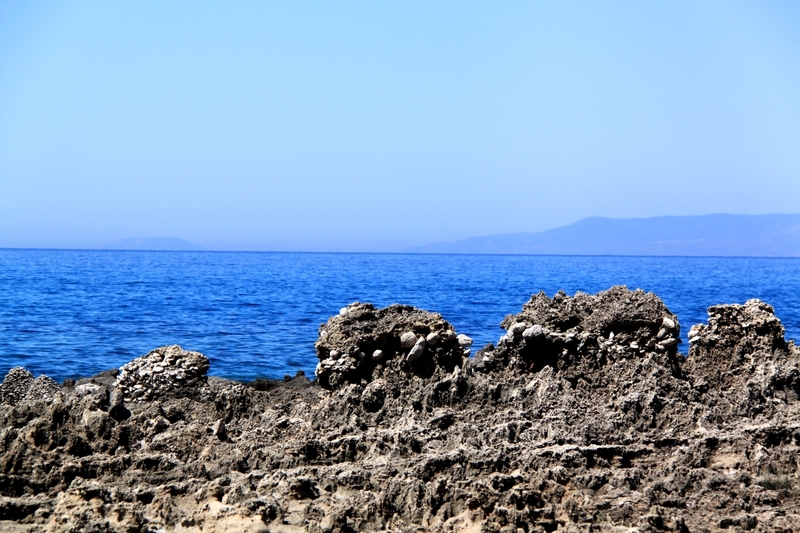 Every time I try to have an easy day to recover from a series of long, strength sapping walks in the Greek sun …. I get it wrong. Wednesday was to be a gentle amble along the coast road northwards from Kardamili before striking off onto a footpath gently meandering over the headland. Problem was that the path goes off the edge of the map. And therein lies the worrying problem. 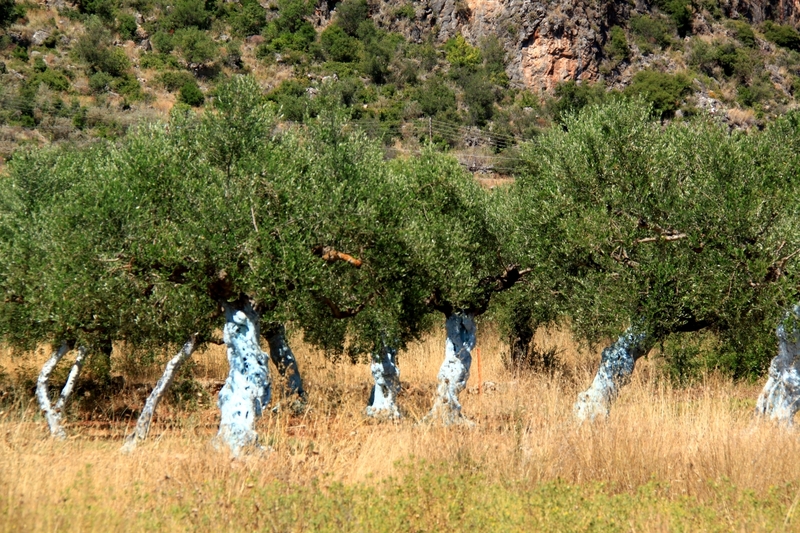 But before we get there, a small ramble about olives. 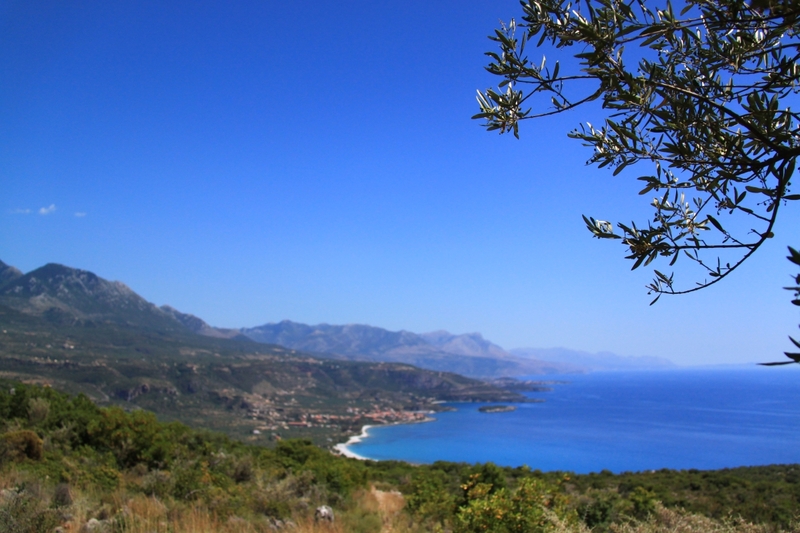 Whatever else you may have heard, the best olives in the world are Kalamata olives. The rest are just fit for turning into olive oil (which I use in copious amounts I might add). I had a Greek salad on Tuesday evening, liberally furnished with olives. They were delicious. 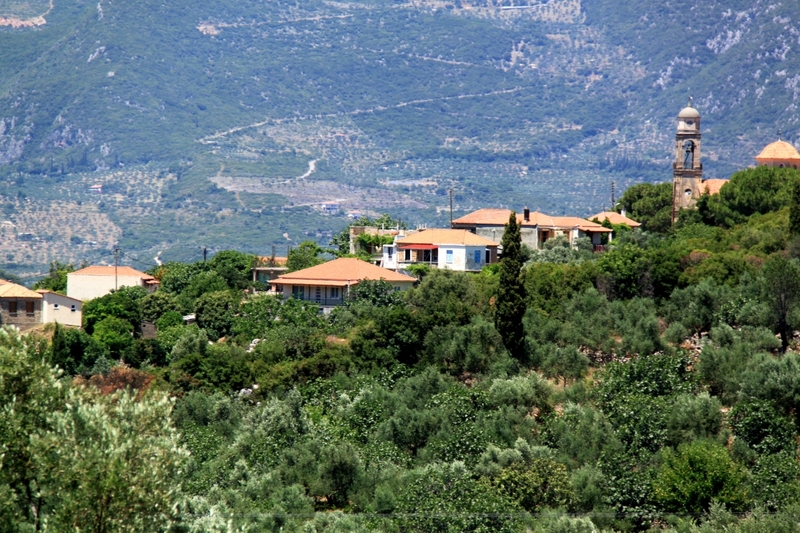 Kardamili is in the Kalamata region and though I have only touched on it a previous blog post, the olive groves are completely different from those around Parga, Paxos and Corfu where ‘olive forests’ is a more accurate description. 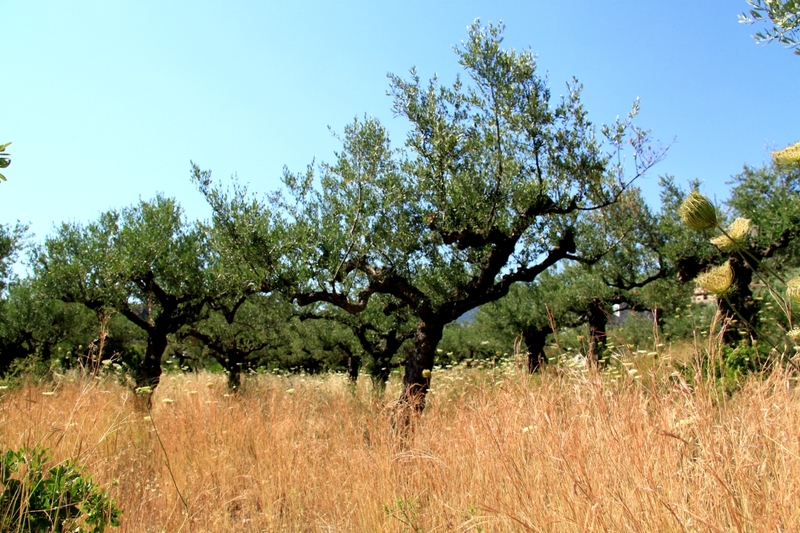 Basically, around Kardamili the olive groves are like well tended apple orchards in the UK: trees evenly spaced in rows following the contours; terraced where necessary; pruned regularly; usually about 15 feet high rarely more than 20. The landscape impression is therefore completely different, a lot more open and light. The ground between the trees seems to be generally cropped for hay. Petrol strimmers are heard everywhere in the mountains in the mornings at the moment as the hay is cut back and left to dry. …. down next to the sea. The walk on Wednesday began as a pleasant amble along the beach road. Not an early start but by 10.30 people were laying themselves out on sunbeds for the day. Except for those ordering breakfast in the beach-side tavernas and trying to decide whether to have beer or wine!?!?!? Then onto a very good paved kalderimi. Not all the coast is white-pebble beach. Some is jagged rock. A bit more rambling here. 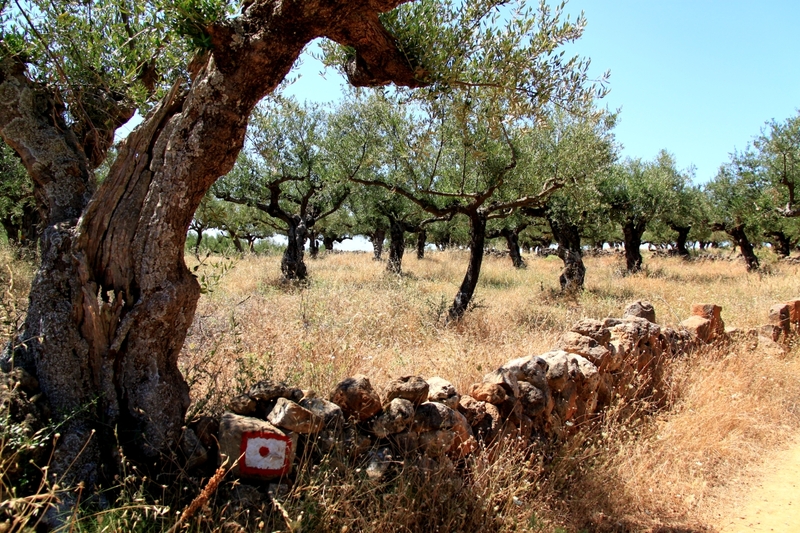 A rough dirt track has been bulldozed to give access to a few properties built at higher levels and to facilitate access to olive groves, cutting across the line of the kalderimi as it zigzaggs at donkey-friendly gradient upwards. But, and that is a big BUT, every time the dirt track crossed the path, the access to the path was preserved and signed. That is a very sharp contrast with other places, particularly Symi in the Dodecanese where a policy of have-bulldozer-will-destroy has prevailed. Significant kalderemia have been annihilated and access to many paths is now by scrambling up loose earth banks. It was a pleasure to walk the path today, though a modest amount of judicious pruning of aggressive foliage would have helped. But that’s nit-picking. One of the attractions of the walk was that it was to Malta. I kid you not. The main concern was that Malta, and the end of the path to it, were off the edge of the map. In fact worse than that, there was a gap between the map to the north of the one I was using and the Kardamili map. Malta and the end of the path weren’t on any map at all!!! Given that Kardamili is tucked into the Taigetos Mountains, not the highest mountains in Europe but at 2000 metres plus not insignificant, it seems somehow inappropriate to bring up the subject, but I was put in mind of the Flat Earth Society. Could they have a point? Given that a pair of human eyes can only see in three dimensions up to about 200 feet and after that the brain interprets from relative positions, what direct evidence do any of us have there that the earth is a geoid? More to the point, what would happen when I reached the edge of the map? Was that it? A drop into The Void? You doubt the existence of the Flat Earth Society? They even have a web site and T-shirts! Everything went fine. 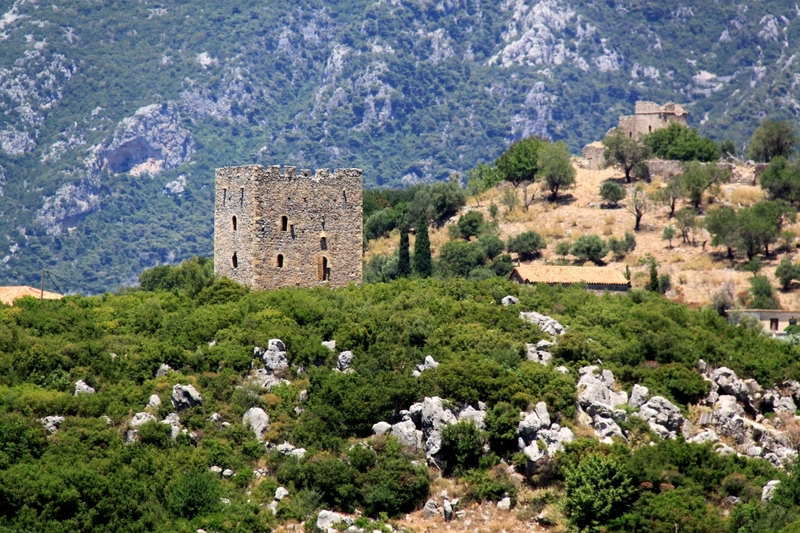 I reached the high point on the kalderimi (only about 200 metres) at a derelict church on the headland from where there were great views down the west coast of the Mani and the line of the Taigetos to the south. From the crest of the hill I dropped down on the kalderimi to join a track heading up higher again to an obvious col. I approached the col cautiously because it was off the edge of the map!! At 360 metres ASL it was marked by a large standing stone. It was like looking off the edge of the page. What I took to be Malta was in view over the other side. It looked nothing like I expected. Not even an island!! And no evident crosses. I decided not to go further than the col. Uncertainty about what might happen if I did had been reinforce by the sight of a dog, looked like a Welsh collie, trotting away from me and over the rim. Dogs in the Greek mountains always bark at you and try to rip you to pieces. They really are very aggressive. But the sight of one trotting way from me over the rim, wagging its tail, into The Unknown, was very unnerving. Especially so when I reached the standing stone at the top and there was no sign of the dog!!!!! Was it trying to entice me over the edge of the flat earth? I’ve seen too many of those old black-and-white films on TV ‘Journey to the Unknown’ to be sure about this. I took a couple of photos of Malta and headed back to the security and safety of the map. 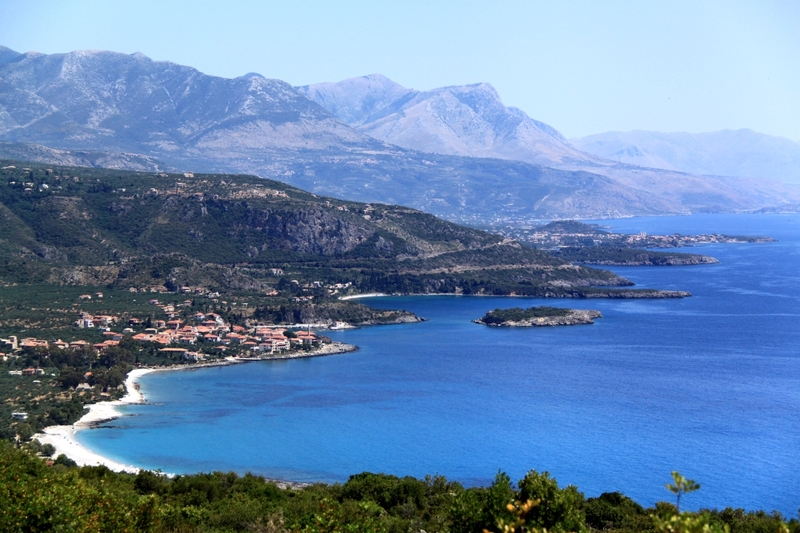 This entry was posted in Greece and tagged Corfu, footpaths, Greece, Kardamili, Mani, olives, Parga, Paxos, Taygetos Mountains. Bookmark the permalink.